UPDATED: Sat., Sept. 23, 2017, 9:31 p.m.
SAN DIEGO – Detoured traffic into Mexico from the busiest border crossing with the United States was unusually light Saturday as motorists heeded calls to avoid freeways during a weekend shutdown for southbound cars. There were no significant delays on the first day of a 57-hour closure of all Mexico-bound car traffic at the San Ysidro border crossing, where about 50,000 cars and 20,000 pedestrians go back and forth on weekdays. Motorists who were directed east to the much-smaller Otay Mesa crossing posted photos to social media celebrating near-empty lanes through late morning. Northbound lanes remained open at San Ysidro, but cars were only about 10 deep, resulting in delays of only a few minutes. Motorists are accustomed to waiting more than an hour. The crossing was also open to pedestrian traffic, which was normal. Crews were 40 minutes ahead of schedule by late morning, Kleppe said. They had removed a large metal canopy spanning southbound lanes into Mexico and were tearing up its concrete foundation. U.S. officials repeatedly warned travelers to avoid driving to Tijuana from San Diego until the crossing reopens Monday at noon. Adolfo Ducreux, who waited five minutes to enter the U.S. from Mexico by car at San Ysidro and only three minutes to return on the detoured route, said the message got through. On Monday, southbound lanes will narrow to three from five while Interstate 5 is realigned to feed into a renovated arrival point. U.S. officials expect traffic flows to go back to normal by Thanksgiving, when four lanes will be open. 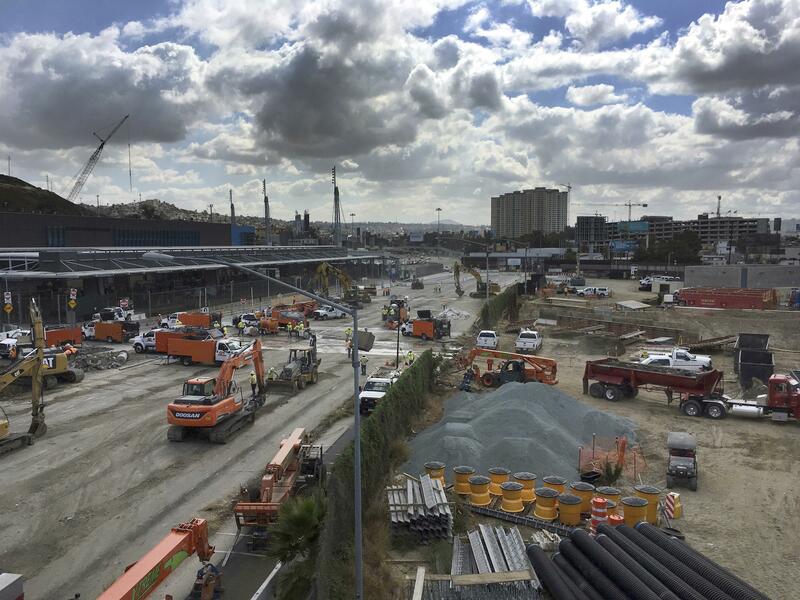 Once the $741 million expansion is completed in 2019, there will be 10 southbound lanes – twice the current number– to handle the estimated 40,000 vehicles that pass through San Ysidro on weekends. The expansion also adds eight more lanes from Mexico to the United States. The work is believed to represent the largest renovation of a crossing along the nearly 2,000-mile U.S.-Mexico border. It has been in the works for years to ease congestion and boost cross-border commerce. Published: Sept. 23, 2017, 5:12 p.m. Updated: Sept. 23, 2017, 9:31 p.m.